The sneering Sharks erupted into laughter at this advertising space bought by a Durban BMW dealership that had a keen wit and an exceptional eye for a marketing opportunity, and the fire of retribution that captain Mark Andrews had been stoking in his team all week was given another blast. The Sharks had lost the 2000 final they had been heavily-favoured to win in Durban and they were now on a bus headed for Newlands to take their broadsword to the dainty rapiers of the “Province poofies”, as the gung-ho Sharks of that era perceived matters. Heavy-hitting Butch James and flame-tempered AJ Venter were in the vanguard and they were intent on avenging the shock-loss by hoisting the trophy in Cape Town. But how did this delightful backdrop to a Currie Cup final come to pass? Well, it had a lot to do with two rival captains in Corne Krige and Mark Andrews that were as competitive as they were robust; you did not want to meet either of them in the dark alley of a loose scrum! 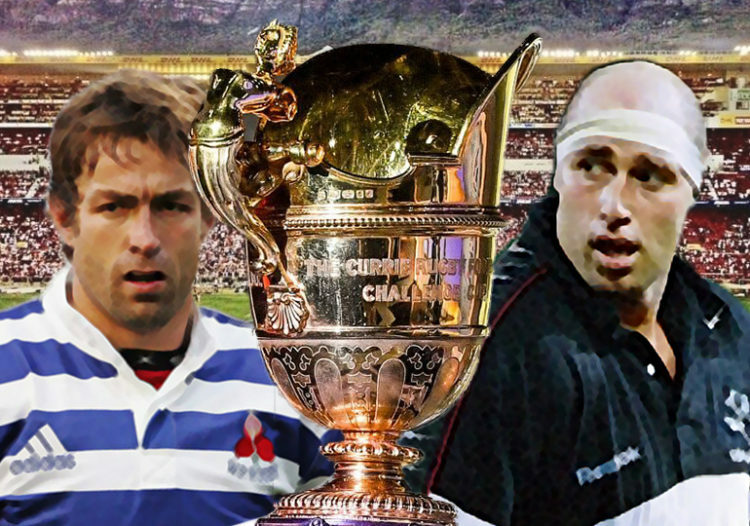 The bad feeling in fact dated back to a league match in Durban not long before the 2000 final, a spiteful encounter in which the Sharks clobbered Province, on and off the ball, for an emphatic victory. The Sharks’ outside centre that day, Trevor Halstead mimicked his captain with a similar offence on Paulse. The bad feeling between the teams festered through the 2001 season and it led to Krige hatching a plot to unhinge the “bully-boy Sharks” ahead of the final. He later said: “We decided that in media interviews we would bait the Sharks by saying they were a dirty team and that Andrews should control himself and his players better. And we got the message out to the match officials that they needed to watch out for the Sharks punching off the ball. It truly was a bad week for Andrews. In fact they hardly get worse for a rugby player. Just a few hours after the glee of the Whine Country billboard, Andrews pulled a calf muscle in the captain’s practice at Newlands. And the next day he sat in the stands watching his team get beaten. Seldom has there been a more colourful case of the proverb, ‘he who laughs last, laughs loudest’. Nice story! I so miss the days when a subtle little punch in the scrum would go unnoticed without replay after replay. This game is going the same way as the 2000/2001 games. The Sharks are going to mean business come Saturday and our boys better be up for this. It’s going to be brutal! GO PROVINCE! Whilst the official announcement of the Springbok EOYT side will only be made after the match on Saturday, those that make the side will depart on Saturday evening to Europe. The point is that whilst we will have to wait for the announcement, the players will need to know ahead of time, so they can pack, feed the cat and perhaps bring their passports along! If the media speculation has any truth in it regards those making the side and in particularly those from the Sharks being overlooked, then I would not want to be on the field on Saturday in Blue & White Strip, because there will be some pretty robust young men wanting to make a statement! That’s for sure! I think this game is going to be pretty brutal. Discipline could be the difference between winning and losing.